Home Base PC, a powerful PC in small outlook features Intel KBL Core, 4 to 16GB RAM, 128 to 512GB SATA SSD or 500GB to 2TB HDD. Supporting 2 monitors by 2 display ports. Windows 10. HBPC features powerful platform to enhance entertainment experience and makes it a much more capable system for embedded usage. It comes with USB 2.0 or USB 3.0 that reserve the ability for faster data transfer as well. 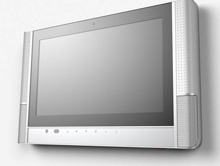 HCBI features Intel Baytrail T CR with 2GB DDR3L RAM, on Board 8GB eMMC and 5 points touch screen. HCBI provide excellent smart home devices control in a fascinate outlook on the wall. Bring a enjoy and quality life for residents by easy and accurate control amomg smart devices at home.